This is a hard post to write. I visited my blog recently as a reader, not a writer, and wondered who this person is that wrote all these wonderful things about motherhood. It doesn’t feel like it could be me sometimes, even though I remember it. I long to embody the concepts that I wrote about not that long ago. But some days I feel very far away from being a powerful, joyful mother. Some days I forget what it feels like to know I’m doing divine work or anything that matters, and I don’t know how to remember even when I read the words that I know are true, words I wrote, that were given to me by inspiration. Sometimes I feel very weak and just want to hide away. Some days, some weeks, and some months are like that. Some days test our strength and courage to go on. I have read many stories of courage and endurance and heroics in the face of opposition. While I wouldn’t compare myself personally to any of those heroes and what they did, I have thought about what those people had to do to conquer their challenges valiantly, and how it applies to myself and motherhood. They had to have conviction that what they were doing was worth it. They had to focus their minds on a goal and believe in it and be able to envision it. They had to have faith that their quest was possible and faith in the divine power that sustained them. They had to care about their cause and those they served more than their own lives. I am not facing a life threatening illness, climbing mount Everest, or being driven from my home and persecuted. But in some ways, the every-day challenge of getting up and mothering with vision and patience and pressing forward with faith may be an even bigger test of courage, because of the sheer length of the challenge. It’s a challenge that requires all of those factors that victors and heroes possess. 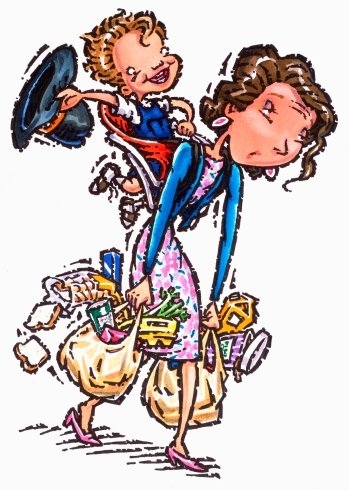 Motherhood never ends – which is both a beautiful truth, and a sobering thought. We are building something that will last eternally. But we spend most of our time in the minutia, and our immediate evidence may not show anything close to the picture of beautiful family life we hope for. When kids act rebellious, stress invades, messes mount, and all evidence points to failure despite our continuous efforts, it can be easy to feel like giving up. Sometimes we even do, temporarily, and bury ourselves in our favorite addictions (tv, chocolate, facebook, hobbies, and other things) or just check out emotionally. There have been times when I just felt tired and wanted to sleep all the time – not just because the baby had been up all night but because I was tired of trying and feeling like I was failing. Getting out of bed may not sound like a courageous act. But sometimes it takes all the courage you can muster to make that decision to go and try again and have faith that it will make a difference in some small way. It takes courage when your to do list has you wondering where in the world to start. When you know that your children can and will make their own choices despite your best efforts, that they will make mistakes, it takes courage to be consistent and keep teaching them anyway. It takes courage when a child turns away from you, to keep saying ‘I love you anyway.’ I know there are many additional factors such as health problems, financial problems, marriage struggles, single parenthood, special needs, and other challenges that many mothers have to overcome in addition to just carrying on with faith and hope in mothering. That takes vision, and real courage! I find that the times it is hardest to pray, that’s when I need it the most. When I feel like a failure, it’s easy to believe the lie that God must think I’m a failure, too, which makes me afraid to talk to Him. It may take some time, but exercising even a desire to believe in His love, and consistently taking time to break down the self-imposed walls I put between me and God, will ultimately bring a sweet assurance that is worth the effort and whatever amount of time it takes. I know this from experience, I am just having to remind myself. Gratitude is a harder one for me to remember sometimes. I’m grateful to a friend who was bold enough to tell me that I was being ungrateful when I refused to acknowledge the progress I have made just because I have further to go. I also find that when people compliment me on good things they see my kids do, I tend to think ‘well, if they knew how they were acting half an hour ago they might not be so impressed’ or ‘yes, but I wish I could just get them to work on xyz’ instead of seeing the good that they see and the part I may have played in that. I am working on thanking my kids and even myself for the things we are doing well, and not focusing so much on what needs to change. This post is part of my effort to do #3: being honest. I wish I could always be an example of joyful, mindful, powerful mothering and only uplift and strengthen others. I don’t like being the one who needs uplifting, and at times I have even felt very angry with myself that I can’t seem to live what I have written and believe in all the time. I want to be strong and I’ll admit, it hurts my pride to confess my struggles to others. But feeling like I have to act strong when I’m not and believing I can’t share my struggles only makes them heavier. So here’s my confession: I have been struggling and haven’t felt at all qualified to write about motherhood or power or any of that lately. Some days I have a hard time getting out of bed to face the day. I’m learning some new skills of patience with myself and my energy levels and celebrating small successes. I’m getting a chance to choose the thoughts and actions and beliefs that empowered me in the past, all over again. I’m being humbled and reminded how much I need God in both the ordinary challenges and the bigger ones. I’m feeling a little weak some days, but looking forward to weak things becoming strong as I turn to Him. What you mentioned that feeds your faith is very inspiring. This was such a sincere post–and it reminded me what feeds my faith! Thanks for sharing your thoughts 🙂 It’s not always easy to do.